All evidence is evidence only in the context of some kind of causal reasoning. "Numbers themselves are always assumed in application to mark more than numerical differences." Cheering is not purely emotive. To cheer at least implicates that the occasion of the cheering is something at which to cheer; and if you cheer at something loathsome, I may not only disapprove but disagree. As all things subject to divine providence are measured by eternal reason, all things partake in some way in eternal reason, namely, insofar as they are intelligible. Authority cannot be determined entirely independently of merit, although the connection may be indirect. A general council may have special eminence in point of unity, in point of sanctity, in point of catholicity, or in point of apostolicity, as long as it is not lacking eminence in the other notes. Note that Palamas identifies (150ch70) divine energies with the Gifts. "insofar as God is in Himself, He is hidden to us"
much of temptation consists in distraction from higher good. The pervasiveness of religion is one of the reasons that freedom of religion must have protections from government intrusion. The instrumental goodness of something requires that it have at least some features that are intrinsically good. Every experiment builds on a more fundamental set of interactions with the physical world. Free choice arises from our ability to distinguish real good from merely apparent good. What is not understood has not yet been proven. Anything compared may be considered insofar as it is a measure or template for other things and thus as quasi-abstract. Anything abstract may be considered in hypothetical instance or example and thus as quasi-concrete. The sacraments are not mere duties to God but rites in which God takes part. In Zwingli, the Eucharist is entirely an act we do: "when you comfort yourself thus" "when you do internally what you represent externally". The Eucharist is not merely a memorial of Christ's death, although it is that; it is a memorial of Christ. We must not merely remember him as a man on a Cross but as the Word made flesh, who died and rose and sits at the right hand of the Father, thence to judge of the livign and the dead, whose kingdom will have no end. Theories of reference need to be considere din the context of theories of proof, since the two surely affect each other. What before/after (temporal) accounts of causation get right is the directionality of act/potency, one particular version of which is measured by time. As Shepherd implicitly recognizes, however, the act/potency of composition is overlooked by these accounts, and thus one kind of real causation. The justification and merit of Christ fully suffice for our ustification because they are not wholly external to us; the justice of Christ is participable, so that we may be made justice in Him. Our merits likewise are the mercy of God, for His justice is ours, by union with Him. We regularly see subalternation of merit to merit in hierarchical social relation s(e.g., parent-child, ruler-subject, etc. ): meriting so that others may merit. To be an external thing that I can use is to be useful to common good. intelligibility as a "non-natural property"
Reason can do extraordinary things; but it cannot stand against the gates of hell. The cowardice of external action is sometimes just a matter of weakness; that of internal action is often a terrible corruption. In a hierarchy, the lesser echoes the greater. A pattern is that which a mind can select out, thus the problem with trying to explain the mind entirely by patterns. principles of church architecture: (1) order and wise planning; (2) reverence due to God; (3) durability; (4) moderation. Genuine originality derives from the authority of truth. We all die by parts. How wholehearted even fully sincere repentance can be varies according to mood; this is why so many saints have asked for the gift of tears. (1) feasts of Our Lord, Our Lady, and important saints (esp. Apostles and saints with special foundational roles) take precedence over other readings. (2) Scripture serves sacrament (in the context of the lectionary); while scripture has intrinsic value, its value is instrumental qua lectionary. (3) The lectionary should assist in preserving and clarifying the articles of the faith. Secular consciousness attempts to subjugate religious consciousness, treating itself as existing for itself, and religious consciousness as also existing for secular consciousness. Religious consciousness must take this into account, but it does this only by translating or transfiguring its secular labors into a holy work; and in the holy work the religious consciousness recognizes something that does not exist for secular consciousness, cannot exist for secular consciousness, transcends it in value and fundamentality entirely. And in this recognition lies the recognition that religious consciousness, at least in performing the holy work, does not exist for secular consciousness. Comfort is like sweet syrup: its value is great in small doses at the right time, but beyond a certain point it does not scale well. In natural languages in normal circumstances we work with genera of arguments, neighborhoods or families of arguments taken in functional terms. Why may I not speak of your Beauty, since without that I could never have lov’d you? I cannot conceive any beginning of such love as I have for you but Beauty. There may be a sort of love for which, without the least sneer at it, I have the highest respect and can admire it in others: but it has not the richness, the bloom, the full form, the enchantment of love after my own heart. So let me speak of your Beauty, though to my own endangering; if you could be so cruel to me as to try elsewhere its Power. John Keats, letter to Fanny Brawne, 8 July 1819. I confess I've met more than a few of them myself; it's a very human failing, I think, to confuse the attraction of an idea with attraction to a person. Light in Babylon, "Hinech Yafa". A loose rendition of part of Song of Songs 3. Every book has the sentence, "There's a book that talks about apples." There's a book that talks about apples. There's a book that does not mention oranges. Strawberries are full of Vitamin C.
There's a book that has the sentence, "Every book has the sentence, 'There's a book that has the sentence, "Every book has at least one sentence."'" There's a book that has the sentence, "Every book as at least one sentence." Every book has the sentence, "There's a book that has the sentence, 'Every book has at least one sentence'." There's a book that has the sentence, "Every book has at least one sentence." Every book has the sentence, "Every book mentions strawberries." Exactly the same things we said about Book 1 are true, too: it is a Reference Table for the books on the library table, and it is one of the books that it is talking about. This is something new, and something that we have not seen before -- we can have multiple Reference Tables that talk about other Reference Tables. What this means in practice is that we can have strings of Boxes and/or Diamonds. For instance, we can have ◇◇X. The Diamonds don't work any differently. What ◇◇X tells us is that there's a table on which we can find ◇X; and then ◇X on that table tells us that there's a table on which we can find X. This can be tricky. In our example, every book is talking about every book, but this might not be the case. When you have more than one Reference Table, nothing requires that the tables that Reference Table 1 talks about are the same as the tables that Reference Table 2 talks about. Some of them might be, or all of them might be, or none of them might be. This is something we have to learn from the universe of discourse: what are we actually talking about? Suppose we are talking about moments in time. 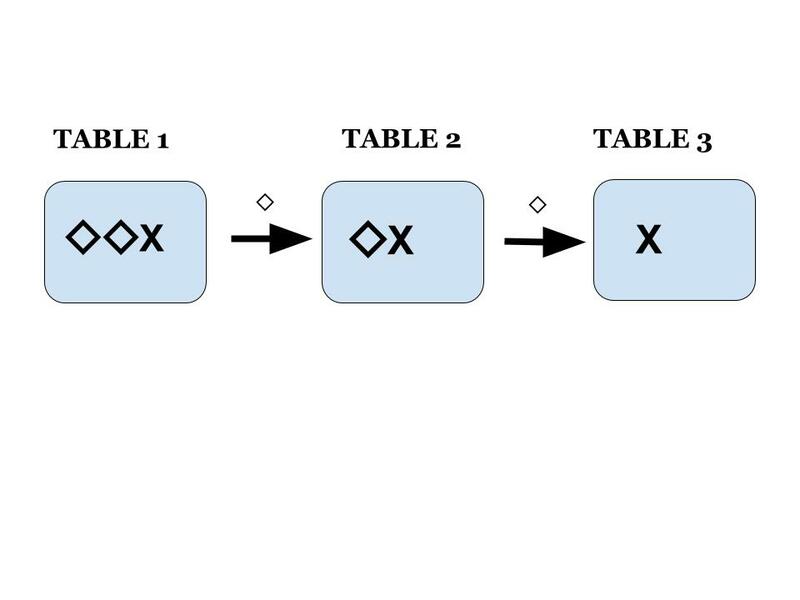 Every table describes a moment in a time, but from each moment in time we learn something about other times -- for instance, what moments in time come after it. This is basically a Diamond: At Some Time in the Future. If I have a given moment, its future is different from some other moment in time. Compared to now, dawn tomorrow is at some time in the future, but once we get to dawn tomorrow, now is not in the future. 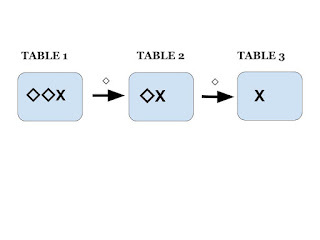 Thus some of the tables describing future moments are shared when we take the table for now as our Reference Table and when we take the table for dawn tomorrow as our Reference Table, but the table of future moments for now makes comments on moments that the table for dawn tomorrow cannot. This gives our analysis more flexibility, but does not introduce any fundamental changes. But sometimes we want to do more. For instance, if we have 'a moment that is at some time in the future from some time in the future from some time in the future from some time in the future', we would usually want to say that we can just collapse this into 'a moment that is at some time in the future'. This makes ◇◇◇◇ work as if it were just the same as ◇. And what about more complicated mixtures of Box and Diamond? Do we sometimes want to collapse them as well? These require new rules. When we criticize antifa violence we criticize violence that attempts to stop racism and racists. Similarly, when we criticize anarchist violence we criticize violence that attempts to stop intolerance; that attempts to disrupt the capitalist system; that is used in self-defence against police brutality; and that ultimately protects rights. By labeling each side as bad as the other we neglect the danger the Alt-Right and these spin-off groups pose. Antifa is a violence-focused approach to politics that spun off of the Communist Party in the 1930s; various flavors of imitators have been springing up in recent years. As their name implies, they basically try to excuse everything they do as 'anti-fascist' action. In reality, nothing they do actually opposes fascism; fascism is opposed by deliberative politics insisting on reason rather than force, not by smashing windows and burning cars. When we criticize antifa, we criticize the attempt to replace real opposition to fascism with people who think they can engage in low-level domestic terrorism just by calling it 'anti-fascism'. Nobody is fooled. No one is just because of what they claim to oppose, only because of what they themselves do or do not do. The entire argument is somewhat astounding. 'Group A is bad, very bad, so if you criticize Group B's response to it, you are neglecting the danger that Group A poses.' This is errant nonsense, deserving of nothing but contemptuous dismissal. Group B may also be bad. Nor is it any kind of defense that Group A is worse than Group B, as McDonnell tries to argue. That a poison is not as horrifying as another poison does not make it more palatable; the only thing that matters is that it is a poison. There is no forced choice here; one does not say, "Oh, since nerve gas is worse than cyanide, I must tolerate cyanide in my diet to avoid dying of nerve gas." I'll pass on both, and regard people like McDonnell, Antifa apologists, as being contemptible for the same reason I regard Nazi apologists as contemptible: they are poison to all efforts to build a just society. The weakness of our love of ease? Its dark relief of sacrifice. The anthem of the destinies! It's increasingly been recognized that the notion of 'feigning' something (which something is then a 'fiction') plays an important role in early modern philosophy. 'Feign' is not a straightforward word. In the early modern period, it can bear the senses it does today (thus one sometimes sees a distinction between real and feigned), but in general it's actually broader than this, because then it still retains its connection to the original Latin, fingere, and that word's association with making and constructing. Thus even at an earlier stage it is probably accurate to take George Crabbe's nineteenth century definition that it expresses "the production of something out of its own mind, by means of its own efforts" and that, in particular, it tends to be used to describe objects that have no existence except in the mind. The word also is often, although not always, associated with supposition-making, as in Newton's phrase about the reason for gravity, hypotheses non fingo; a hypothesis in this sense is not taken from the experienced phenomena but constructed as a supposition for them. Since therefore the memory, is known, neither by the order of its complex ideas, nor the nature of its simple ones; it follows, that the difference betwixt it and the imagination lies in its superior force and vivacity. A man may indulge his fancy in feigning any past scene of adventures; nor would there be any possibility of distinguishing this from a remembrance of a like kind, were not the ideas of the imagination fainter and more obscure. It is evident, that whatever is present to the memory, striking upon the mind with a vivacity, which resembles an immediate impression, must become of considerable moment in all the operations of the mind, and must easily distinguish itself above the mere fictions of the imagination. Of these impressions or ideas of the memory we form a kind of system, comprehending whatever we remember to have been present, either to our internal perception or senses; and every particular of that system, joined to the present impressions, we are pleased to call a reality. Mean while I shall carry my observation a step farther, and assert, that even where the related object is but feigned, the relation will serve to enliven the idea, and encrease its influence. A poet, no doubt, will be the better able to form a strong description of the Elysian fields, that he prompts his imagination by the view of a beautiful meadow or garden; as at another time he may by his fancy place himself in the midst of these fabulous regions, that by the feigned contiguity he may enliven his imagination. But though I cannot altogether exclude the relations of resemblance and contiguity from operating on the fancy in this manner, it is observable that, when single, their influence is very feeble and uncertain. As the relation of cause and effect is requisite to persuade us of any real existence, so is this persuasion requisite to give force to these other relations. For where upon the appearance of an impression we not only feign another object, but likewise arbitrarily, and of our mere good-will and pleasure give it a particular relation to the impression, this can have but a small effect upon the mind; nor is there any reason, why, upon the return of the same impression, we should be determined to place the same object in the same relation to it. There is no manner of necessity for the mind to feign any resembling and contiguous objects; and if it feigns such, there is as little necessity for it always to confine itself to the same, without any difference or variation. And indeed such a fiction is founded on so little reason, that nothing but pure caprice can determine the mind to form it; and that principle being fluctuating and uncertain, it is impossible it can ever operate with any considerable degree of force and constancy. The mind forsees and anticipates the change; and even from the very first instant feels the looseness of its actions, and the weak hold it has of its objects. And as this imperfection is very sensible in every single instance, it still encreases by experience and observation, when we compare the several instances we may remember, and form a general rule against the reposing any assurance in those momentary glimpses of light, which arise in the imagination from a feigned resemblance and contiguity. I have already observd, that time, in a strict sense, implies succession, and that when we apply its idea to any unchangeable object, it is only by a fiction of the imagination, by which the unchangeable object is supposd to participate of the changes of the co-existent objects, and in particular of that of our perceptions. This fiction of the imagination almost universally takes place; and it is by means of it, that a single object, placd before us, and surveyd for any time without our discovering in it any interruption or variation, is able to give us a notion of identity. The supposition of the continued existence of sensible objects or perceptions involves no contradiction. We may easily indulge our inclination to that supposition. When the exact resemblance of our perceptions makes us ascribe to them an identity, we may remove the seeming interruption by feigning a continued being, which may fill those intervals, and preserve a perfect and entire identity to our perceptions. Our memory presents us with a vast number of instances of perceptions perfectly resembling each other, that return at different distances of time, and after considerable interruptions. This resemblance gives us a propension to consider these interrupted perceptions as the same; and also a propension to connect them by a continued existence, in order to justify this identity, and avoid the contradiction, in which the interrupted appearance of these perceptions seems necessarily to involve us. Here then we have a propensity to feign the continued existence of all sensible objects; and as this propensity arises from some lively impressions of the memory, it bestows a vivacity on that fiction: or in other words, makes us believe the continued existence of body. It is indeed evident, that as the vulgar suppose their perceptions to be their only objects, and at the same time believe the continued existence of matter, we must account for the origin of the belief upon that supposition. Now upon that supposition, it is a false opinion that any of our objects, or perceptions, are identically the same after an interruption; and consequently the opinion of their identity can never arise from reason, but must arise from the imagination. The imagination is seduced into such an opinion only by means of the resemblance of certain perceptions; since we find they are only our resembling perceptions, which we have a propension to suppose the same. This propension to bestow an identity on our resembling perceptions, produces the fiction of a continued existence; since that fiction, as well as the identity, is really false, as is acknowledged by all philosophers, and has no other effect than to remedy the interruption of our perceptions, which is the only circumstance that is contrary to their identity. The imagination tells us, that our resembling perceptions have a continued and uninterrupted existence, and are not annihilated by their absence. Reflection tells us, that even our resembling perceptions are interrupted in their existence, and different from each other. The contradiction betwixt these opinions we elude by a new fiction, which is conformable to the hypotheses both of reflection and fancy, by ascribing these contrary qualities to different existences; the interruption to perceptions, and the continuance to objects. Nature is obstinate, and will not quit the field, however strongly attacked by reason; and at the same time reason is so clear in the point, that there is no possibility of disguising her. Not being able to reconcile these two enemies, we endeavour to set ourselves at ease as much as possible, by successively granting to each whatever it demands, and by feigning a double existence, where each may find something, that has all the conditions it desires. In order to reconcile which contradictions the imagination is apt to feign something unknown and invisible, which it supposes to continue the same under all these variations; and this unintelligible something it calls a substance, or original and first matter. But the mind rests not here. Whenever it views the object in another light, it finds that all these qualities are different, and distinguishable, and separable from each other; which view of things being destructive of its primary and more natural notions, obliges the imagination to feign an unknown something, or original substance and matter, as a principle of union or cohesion among these qualities, and as what may give the compound object a title to be called one thing, notwithstanding its diversity and composition. In our arrangement of bodies we never fail to place such as are resembling, in contiguity to each other, or at least in correspondent points of view: Why? but because we feel a satisfaction in joining the relation of contiguity to that of resemblance, or the resemblance of situation to that of qualities. The effects this propensity have been already observed in that resemblance, which we so readily suppose betwixt particular impressions and their external causes. But we shall not find a more evident effect of it, than in the present instance, where from the relations of causation and contiguity in time betwixt two objects, we feign likewise that of a conjunction in place, in order to strengthen the connexion. Our propensity to this mistake is so great from the resemblance above-mentioned, that we fall into it before we are aware; and though we incessantly correct ourselves by reflection, and return to a more accurate method of thinking, yet we cannot long sustain our philosophy, or take off this biass from the imagination. Our last resource is to yield to it, and boldly assert that these different related objects are in effect the same, however interrupted and variable. In order to justify to ourselves this absurdity, we often feign some new and unintelligible principle, that connects the objects together, and prevents their interruption or variation. Thus we feign the continued existence of the perceptions of our senses, to remove the interruption: and run into the notion of a soul, and self, and substance, to disguise the variation. But we may farther observe, that where we do not give rise to such a fiction, our propension to confound identity with relation is so great, that we are apt to imagine something unknown and mysterious, connecting the parts, beside their relation; and this I take to be the case with regard to the identity we ascribe to plants and vegetables. What I have said concerning the first origin and uncertainty of our notion of identity, as applied to the human mind, may be extended with little or no variation to that of simplicity. An object, whose different co-existent parts are bound together by a close relation, operates upon the imagination after much the same manner as one perfectly simple and indivisible and requires not a much greater stretch of thought in order to its conception. From this similarity of operation we attribute a simplicity to it, and feign a principle of union as the support of this simplicity, and the center of all the different parts and qualities of the object. It is a quality, which I have already observed in human nature, that when two objects appear in a close relation to each other, the mind is apt to ascribe to them any additional relation, in order to compleat the union; and this inclination is so strong, as often to make us run into errors (such as that of the conjunction of thought and matter) if we find that they can serve to that purpose. Many of our impressions are incapable of place or local position; and yet those very impressions we suppose to have a local conjunction with the impressions of sight and touch, merely because they are conjoined by causation, and are already united in the imagination. Since, therefore, we can feign a new relation, and even an absurd one, in order to compleat any union, it will easily be imagined, that if there be any relations, which depend on the mind, it will readily conjoin them to any preceding relation, and unite, by a new bond, such objects as have already an union in the fancy. Thus for instance, we never fail, in our arrangement of bodies, to place those which are resembling in contiguity to each other, or at least in correspondent points of view; because we feel a satisfaction in joining the relation of contiguity to that of resemblance, or the resemblance of situation to that of qualities. And this is easily accounted for from the known propertes of human nature. The difficulties, that occur to us, in supposing a moral obligation to attend promises, we either surmount or elude. For instance; the expression of a resolution is not commonly supposed to be obligatory; and we cannot readily conceive how the making use of a certain form of words should be able to cause any material difference. Here, therefore, we feign a new act of the mind, which we call the willing an obligation; and on this we suppose the morality to depend. But we have proved already, that there is no such act of the mind, and consequently that promises impose no natural obligation. From 1942 to 1950, Isaac Asimov published a number of short stories in Astounding Magazine inspired by the History of the Decline and Fall of the Roman Empire -- a little bit of cribbin' from the works of Edward Gibbon. These were collected into volumes from 1951 to 1953, forming the Foundation Trilogy. Asimov returned to Foundation in the 1980's with a set of sequels and prequels. The first three are universally recognized as better than the later works, although I personally have always liked Prelude quite a bit as well. In any case, I'll be reading them all for the fortnightly book, in the narrative order. Deep Purple, "The Mule", which was inspired by a reading of Second Foundation.